BOHEMIA started his career as a near-novelty, a south Asian teenager in California delivering Punjabi rap, a style of music, unheard of at the time. But after two studio albums and a brief appearance in Bollywood movies, Bohemia has pretty much reinvented the Desi pop music scene. His last self written/produced album Da rap star  hit #1 upon release on Planet M/Music World Chart in India. 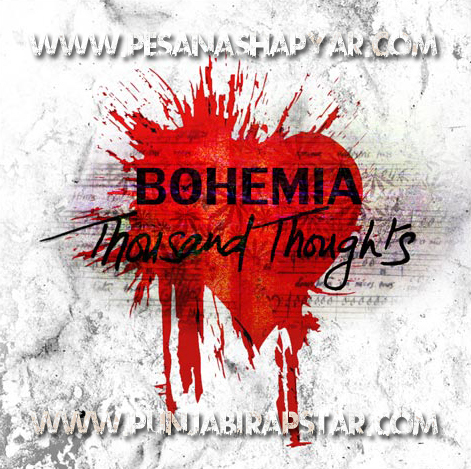 It also earned Bohemia multiple award nominations including ‘album of the year’ at the UK AMAs. Although three years have passed since Ek tera pyar, the organic loyal following of Bohemia has only increased [Evident by Facebook.com/realbohemia with over 600,000 likes without paid promotion]. And it seems like the self-made rap star has a Thousand Thoughts on his mind that he plans to share August 30th 2012. Stay Tuned on PesaNashaPyar.com as we countdown to the release of the much anticipated LP and lookout for exclusive behind the scene news and updates coming soon.